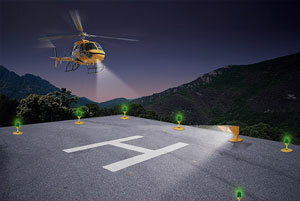 Genesis Lamp is among the world’s leading heliport and helipad lighting suppliers. Heliports and helipads across the U.S. and around the world use our lighting systems. Whatever type of heliport or helipad lighting system you’re searching for, you’re sure to find it in our extensive catalog. Genesis Lamp is proud to offer heliport lighting that’s designed to meet FAA and international heliport guidelines. We strive to provide the most up-to-date and cost-effective heliport lighting options available to our customers. Genesis Lamp is a distributor for Avlite solar aviation airport lighting. Avlite is a leading producer of solar-powered aviation lighting equipment and the manufacturer of solar heliport lighting and obstruction lighting. We are proud to work with this world-class manufacturer offering a proven reputation for designing aviation lighting systems that meet the needs of defense, government, civil and humanitarian aid operations in the toughest environments. When you're looking for a heliport or helipad lighting system, check out our complete line of lighting solutions, heliport landing equipment, replacement light bulbs and parts. This includes Final Approach and Takeoff Area (FATO) lighting, Touchdown and Liftoff Area (TLOF) lighting, approach lighting, aiming point lights, landing direction lights, taxiway and apron lighting, and Visual Approach Slope Indicators (VASI).